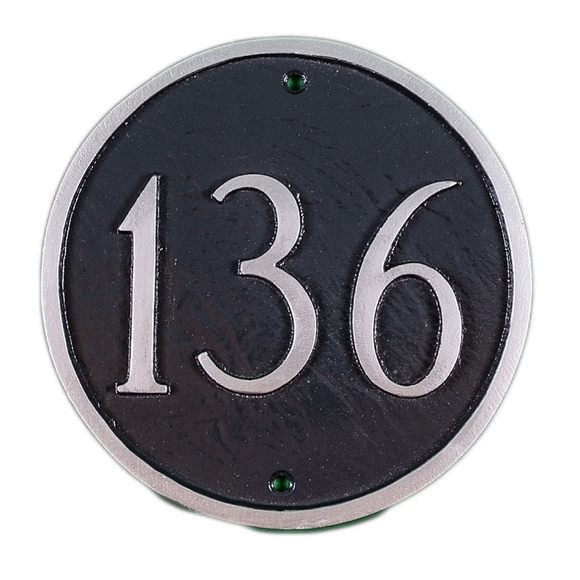 Personalized Large Circle House Number Sign - - 15" diameter or 18" diameter round address plaque holds one line of numbers. Maximum capacity is five numbers. Made in USA. Custom made with your street number and color scheme selection. The large size 15" diameter sign holds up to three 7" or five 4" numbers. The estate size 18" diameter sign holds up to three 8" or five 5" numbers. Please be sure to type the street number exactly as you want it to appear. Solid cast aluminum construction. Characters and border are part of the sign, not added on. I waited a long time to order a address sign for the house. I LOVED this sign! Adds curb appeal and looks good at night.